Home / 4. How Booking Works / Send booking. 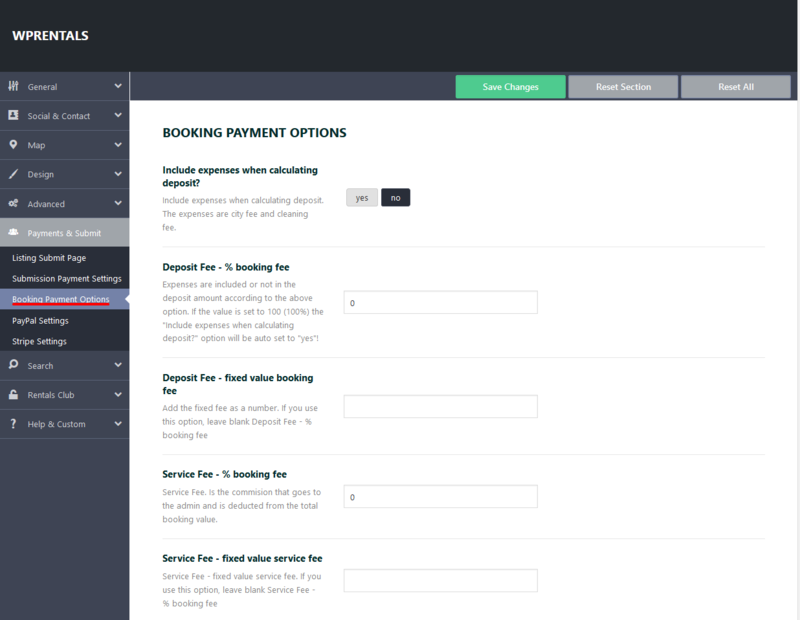 Approve booking & Issue invoice or reject booking as owner. Cancel Request. Cancel confirmed booking. 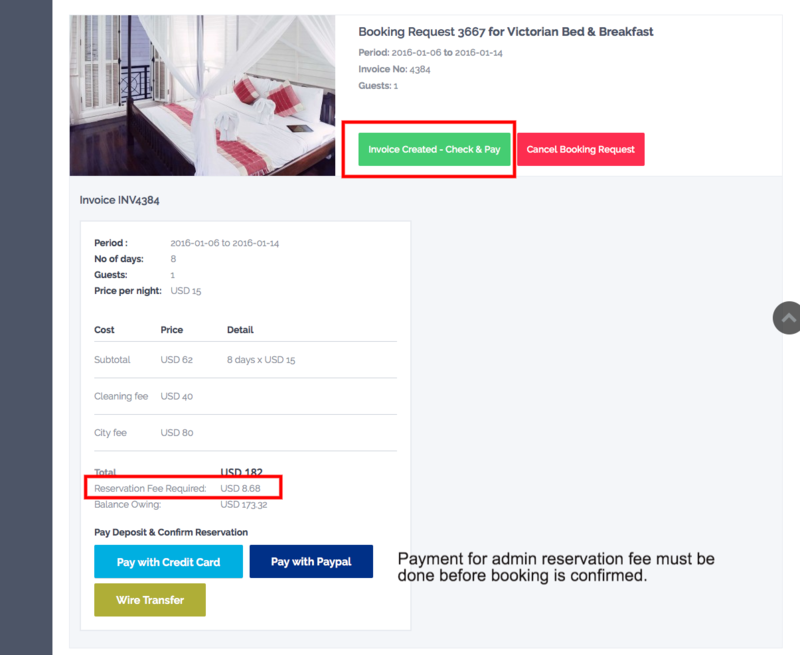 Pay Admin fee to confirm booking. Send booking. Approve booking & Issue invoice or reject booking as owner. Cancel Request. Cancel confirmed booking. 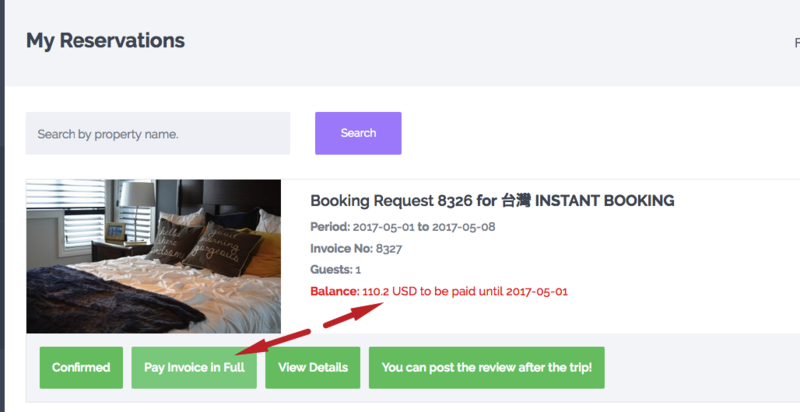 Pay Admin fee to confirm booking. In the theme we use only 1 user level. We refer to the owner as the person who submits the property, but all users registering will have a profile created automatically and the profile URL will include the “owner” name in the url. Owner: Approve Booking & Issue Invoice. Reject Booking. Cancel Booking. Owner: Approve or reject a booking request. Admin fee is set to 0. Owner: Approve or reject booking request. Deposit fee must be paid before booking is confirmed. 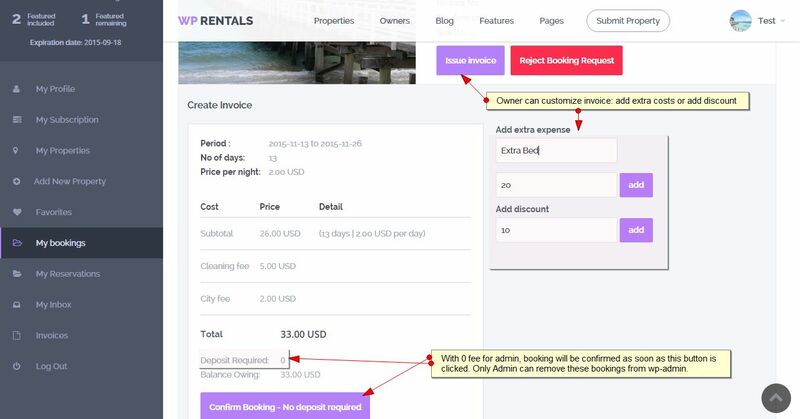 User: How to pay Admin Deposit request for booking to be confirmed (after owner approves request). Users submit a booking request after they login/register. APPROVE BOOKING & ISSUE INVOICE. REJECT BOOKING. CANCEL BOOKING. 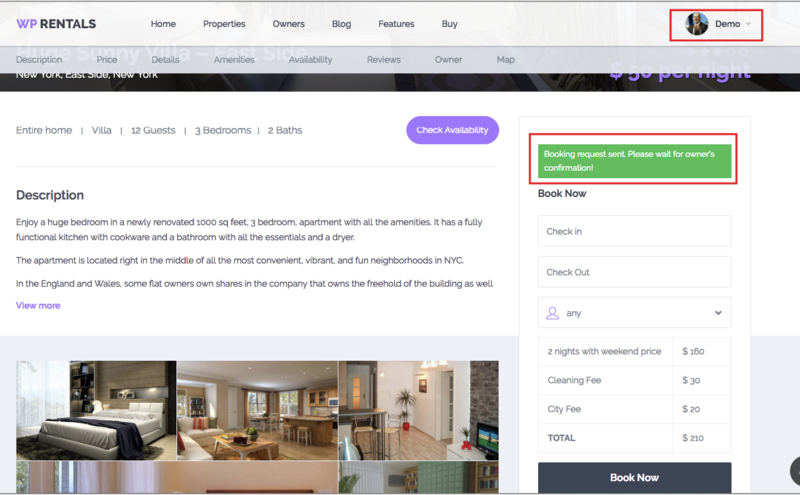 The user who submits properties (property owners) will receive an email notification when a new booking request is received from another user. You have received a new booking request on http://yourdomain.com! 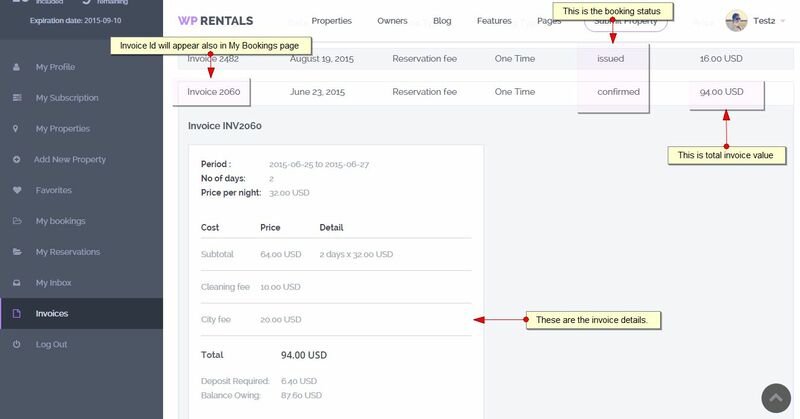 Go to your account in "Bookings" page to see the request, issue the invoice or reject it! User who submits property (owner) will see all bookings made for his property in User Dashboard -> My Bookings. 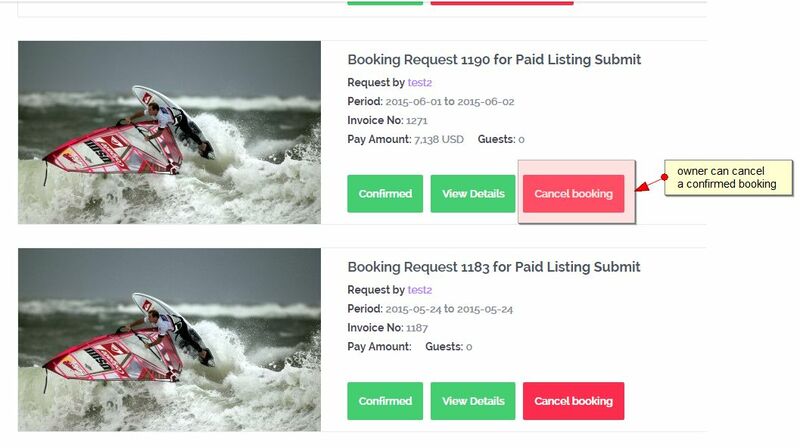 Rejected Bookings will be deleted automatically from user dashboard and admin. User will be notified via email that his booking request was rejected or canceled. But the booking request will no longer be available in his dashboard either. The owner can cancel the confirmed bookings as well. Approve or reject a booking request. Admin fee is set to 0. 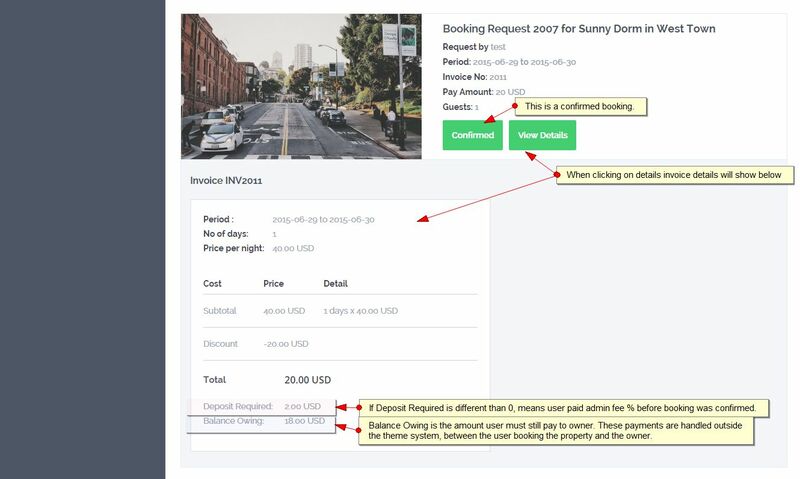 When a booking request is received, the user submitting the property (property owner) will be asked to issue an invoice or reject the request. Issue invoice by the property owner is the first step in confirming booking. This means that the booking will be confirmed by the user who submits the property (owner) when he sends the invoice. Approve or reject a booking request. Deposit fee must be paid before booking is confirmed. All these BEFORE payment is made by the user who submitted the booking request to admin and have his booking request confirmed. 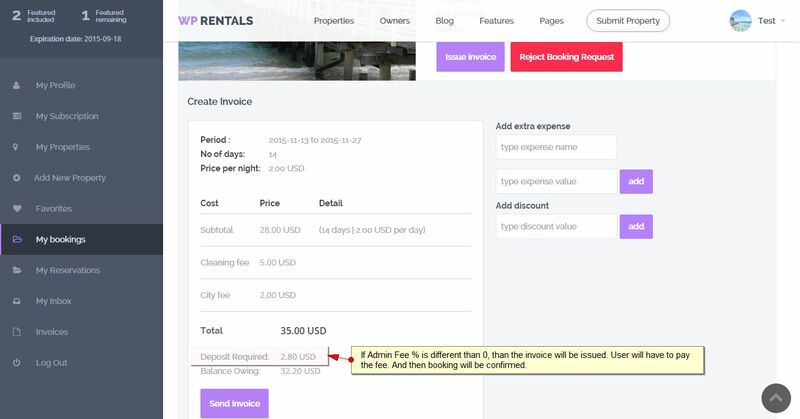 If 2 or more booking requests are sent for the same date/property – 2+ invoices were issued, the theme will allow only the first payment to be processed. The user who submits the booking request gets the notification that an invoice was issued and he needs to pay the deposit fee before booking is confirmed. When you add Deposit fee, there will be a reminder email to make the remaining payment before the beginning of the booking. The remaining payment can be done from My Reservations page at any time (money go to admin) But paying the remaining invoice is optional!